New about this balance reader is, that it can be controlled via an ISO 7816 compatible command. Smart card, such as the JavaCard®, MultOS® or the BasicCard® are capable of learning new "ISO7816 commands". 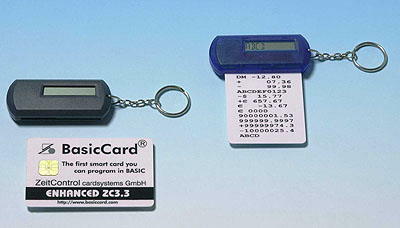 This simplifies the adaption of a balance reader to one of the smart cards mentioned above. Thus expensive adaptions of the pocket card reader are not necessary. The balance reader is equipped with a 10 character display. It can show data from a smart card, such as sums of money, loyalty points or a PIN.